Who would have thought that selling out of wood would actually be something to worry about? 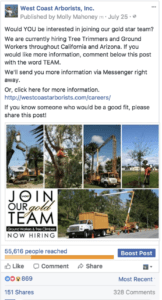 Local business West Coast Arborists, Inc. found themselves with that issue after they used Messenger Bots in a Facebook Ad. West Coast Arborists, Inc. (WCA, Inc.) was established in 1972. Today, the family-owned company is providing professional tree maintenance and management services for over 200 municipalities and public agencies throughout the states of California, Arizona, and Nevada. One of the many things that sets this business apart is their mission to preserve the beauty of the wood by creating amazing slabs for purchase. WCA, Inc. created a Facebook post to spread the word that they had beautiful wood slabs available for purchase at a new location in Ontario, CA. In this post, the business used a Facebook Comment Growth Tool through ManyChat so that people had to comment with the word “SLAB” to get the actual location of the purchase location in Ontario. They then boosted the post using Facebook Ads for $1300. While the hope was to spread the word, the results they got were quite a surprise! They sold out…as in, no slabs left. This is super cool! Learning from what works best, WCA, Inc. used the same strategy two days later as Now Hiring post. 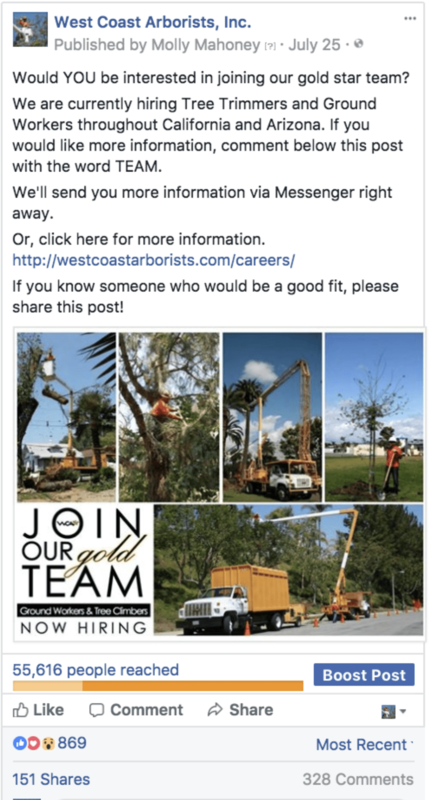 With the same Facebook Comment Growth Tool strategy, viewers could comment “TEAM” to get more information about job openings for Tree Trimmers and Ground Workers in California and Arizona. The results proved to be better than any hiring campaign that had in the past, which included platforms like Craig's List and local job posting sites. So crazy! People think that only business that have a heavy presence on Facebook or social media based businesses can benefit from Messenger Bots but that is clearly not the case! This new strategy can provide amazing results for business growth – if you can imagine it, it can get done! How can Messenger Bots help your business? We are here to help! Join our free Facebook group Facebook Live and Messenger Bots for Entrepreneurs: Elevate Your Awesome. Want to talk strategy? Schedule a free Strategy Session with our Chief Bot Builder!